DEVENS, MA, Feb. 16th, 2017 — Comrex Corporation, a codec manufacturer on the forefront of IP technology, will display a new product, Opal, at NAB 2017. 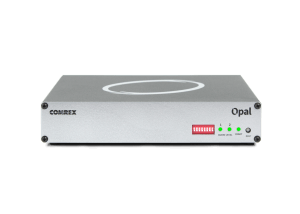 Opal, short for Opus Portal, is an IP audio gateway, and will be available for demo at the Comrex booth, C1633. Perfect for coordinating call-ins with guests who have no technical experience, Opal provides near-studio quality audio with consumer grade equipment. Guests can connect instantly by clicking a link. Opal makes it possible to do long interview segments in HD voice quality, without requiring guests to install apps or fiddle with settings. Once installed, Opal serves a web page to anyone who accesses it through a computer or Android device (with a microphone, earpiece, and browser). This web page will allow a user to click a button and transmit from their computer or phone using the Opus encoder, for excellent fidelity and low delay. Opal can support two discrete connections at once. Opal occupies 1/2U of rack space, and two can fit side-by-side in a 19” rack shelf. Connections to Opal can only be made from browsers that support WebRTC (Chrome and Firefox at this time).